In an evening class at Stanford University the last lecture was on the mind-body connection - the relationship between stress and disease. The speaker (head of psychiatry at Stanford) said, among other things, that one of the best things that a man could do for his health is to be married to a woman whereas for a woman, one of the best things she could do for her health was to nurture her relationships with her girlfriends. At first everyone laughed, but he was serious. Women connect with each other differently and provide support systems that help each other to deal with stress and difficult life experiences. Physically this quality "girlfriend time" helps is to create more serotonin - a neurotransmitter that helps combat depression and can create a general feeling of well being. Women share feelings whereas men often form relationships around activities. We share from our souls with our sisters/mothers, and evidently that is very GOOD for our health. He said that spending time with a friend is just as important to our general health as jogging or working out at a gym. There's a tendency to think that when we are "exercising" we are doing something good for our bodies, but when we are hanging out with friends, we are wasting our time and should be more productively engaged? Not true. In fact, he said that failure to create and maintain quality personal relationships with other humans is as dangerous to our physical health as smoking! So every time you hang out to schmooze with a gal pal, just pat yourself on the back and congratulate yourself for doing something good for your health! We are indeed very, very lucky. So, let's toast to our friendship with our girlfriends. Thanks to all the girls in my life who have helped me stay healthy, happy, feeling understood appreciated, and loved. This quilt was made by many friends for my 60th birthday this year. Not everyone is in the photo. 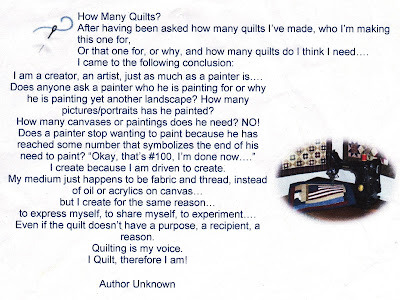 The above text is written with permission of the blog owner, Quilts In The Barn. Thank You. I have always been a devotee when it comes to hand work, piecing and appliqué especially. I have dabbled with English piecing over the years, but lately have been drawn more and more to it. You can fiddle with your fussy cutting or you can just cover papers. It is very accurate, and in many respects it is a no thinking process, soothing and relaxing. Above is part of Folk Art Baskets and Lucy Boston. Both made with papers or English piecing. My quilt Cousin Wattle also has English piecing. My sanctuary and thinking space, where it all happens. Best I could do. Have you ever tried to photograph the rain, not easy. The top photo was taken when on a trip to Japan and the second photo was out my back door this morning. It is a day for sitting in the pj's and covering hexagons I think. Some show and tell from our last class of the year. Ann, with her Cousin Wattle. Faye is hiding behind the middle of her Pear Tree. Here we have two gorgeous versions of the Dollie Sampler which has been mostly hand pieced. Just to show that the quilt was finished yesterday and I am halfway through the quilting. Looks good on my king bed, but needs the other cushions. It is a big quilt, 104 inch square. I have been asked this question many times and my answer has always been "as many as I can make." Thought you might like to have your answer ready the next time someone asks you this question. We have had some much needed rain, but it is also nice to see the sun. It brightens the soul. Some of our lovely beaches. This is a student quilt from a class I taught called Charlotte's Web. I own an antique quilt with same design that was hand pieced onto flour sack foundation. I used a modern technique. The back of the quilt. Barbara now has a reversible quilt. While I am typing I am listening to a very soothing sound, rain. Not the damaging rain and wind that others have had, but soft soothing rain. Winter Cabins, this is a quilt that I designed in 2000. It is so called because it is made entirely from flannel and is a very snuggly quilt. Winter cabins was a very successful class quilt and is still one of my favourites. The centre section has been hand quilted. Proof I am sitting here working on my last border. All this mindless tacking while I watch my favourite movies, well listen more than anything. It is quite windy here today, so a good chance to get some sewing done. I am also thinking about my next project. Last year at the quilt show I bought a dark brown fabric from Carolyn's Quilting room, she called it potato fabric. A good colour description really. It is time I put that fabric into something. Thought you might like to see a photo of my son's wedding that took place in his garden in Darwin. Not sure why this didn't load the first time. I have added some extra photos of my quilt the Pear Tree. I have started the last border and have set myself a deadline for finishing. December 1st, I am shouting the girls who have done a class with me this year a morning tea, and this is when I have made the bold statement to have the quilt complete, quilting included. I hope to have some more photo's of student quilts to add as well.